This past weekend 10 friends (9+ me) went on an adventure from NYC to Vermont. I was actually not really looking forward to the trip since I am strict orders not to ski (I hurt my back...boo) and didn't really know what I was going to do for the weekend (hello blogging prep). I have also been traveling like crazy (I am currently writing this post from an airplane...I'm on my way to San Francisco), so I was less than thrilled for the 10+ hours of driving throughout the weekend! I should clarify that my bad attitude was promptly adjusted once we made it out of the city and I realized that without skiing I would simply be relaxing all weekend (and enjoying some of the most amazing friends...I'm a lucky girl). Other than the time I got to spend with my friends (and our epic chilli dinner - post coming soon), I think my favorite part was discovering the amazing food adventures that are to be had in the middle-of-nowhere Vermont. I forgot how much I LOVE maple syrup shopping and finding local honey. I am now working on a whole wheat pancake in a jar recipe (coming soon). 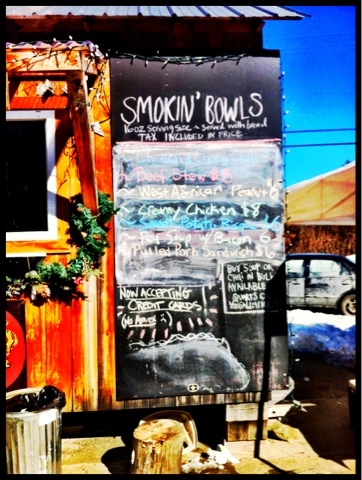 The best new foodie find was the Smokin' Bowls Soup Shack! 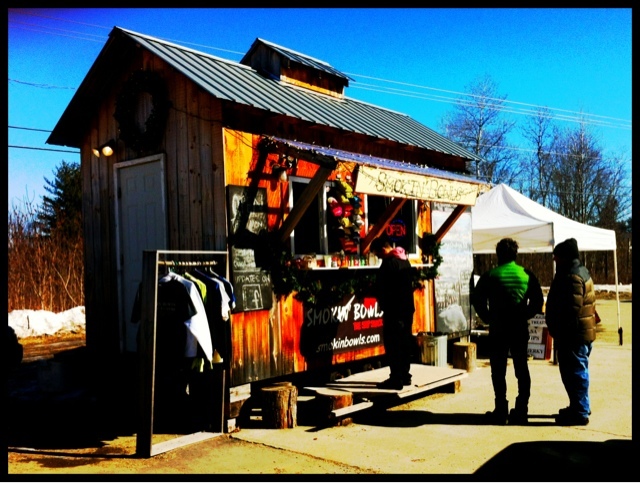 It is an amazingly gorgeous shack next to a highway (in-the-middle-of-nowhere) with the most delicious soups. After scouring the menu, I really had no idea what to order. I LOVE good healthy food, but also LOVE looking at my food before I order. I am a texture, taste, smell person and I don't like everything (I'm a girl who knows what she likes) so this blind ordering was a bit scary. I tried to ask questions before ordering like what is in the African Peanut and How is the curried squash soup made and much to my questions I was not getting clear answers. 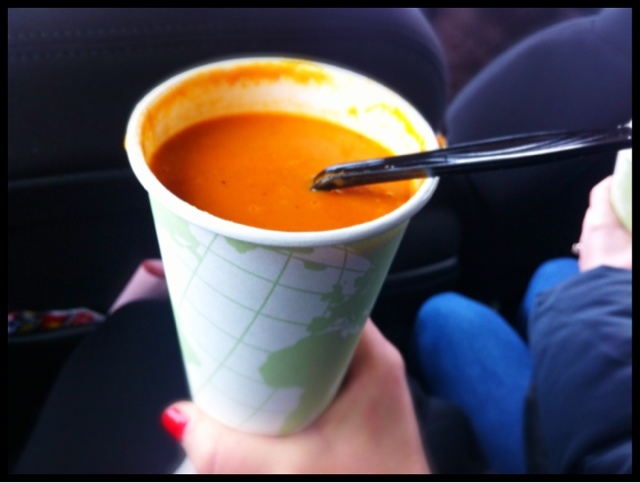 One thing that sparked my interest was when the soup guys mentioned that the African Peanut was Vegan. My first thought was it must be healthy followed by my second thought just veggies are not a meal. Thank goodness healthy won out because this soup was AMAZING. 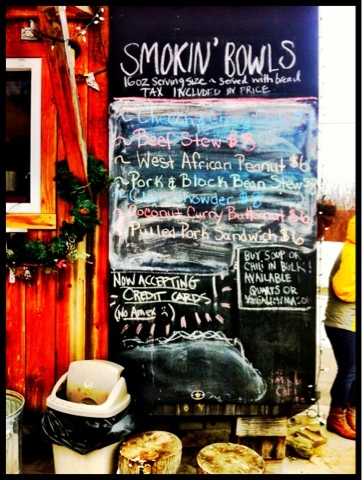 The depth of flavor was incredible and it left the most wonderful spicy peanuty after taste that I really couldn't get enough (we stopped at the soup shack twice and I ordered West African Peanut twice and a quart to take home...can you say obsessed). It was amazing to be so in love with a vegan dish, don't get me wrong I do like vegetables...but generally ALWAYS have a protein at every meal. I have been curious about vegetarian diets for a while and love to consume research about food, so (while I am not ready to make a veg commitment) I am going to explore more vegetarian cooking (including this African Peanut Soup). 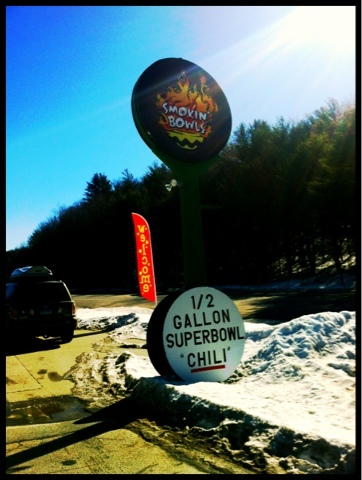 Enjoy the photos of this gorgeous foodie adventure! 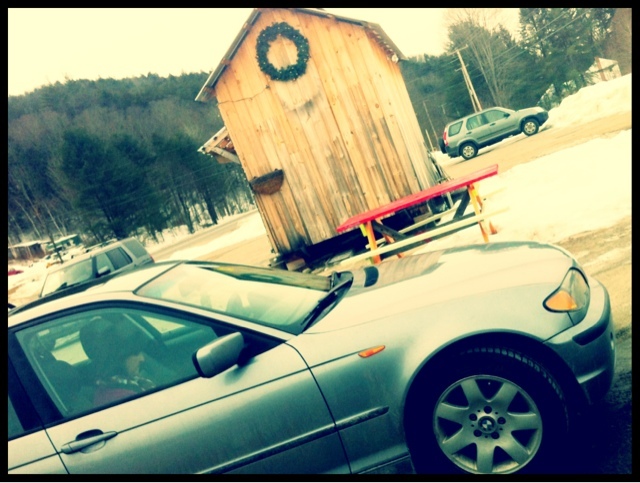 Soup Shack (from the side)...it is truly just a shack on the side of the highway!